New York City’s Anna Steele is back with her new EP, Made Out Of Stars, her first collection of infectious dance pop since 2015’s What’s Mine. The first half is loaded with irresistibly hummable songs which sound modern and yet feel inextricably linked to traditions of past dance and pop genres. An obvious highlight, the ultra catchy “Obsessed” is funky and features some slick Nile Rodgers like guitar playing, while it’s impossible to deny that “Better” is utterly contemporary in every single way. What is common among all of these songs is Steele’s undeniably confident presence and her instinctual knack for a great hook. As a bonus track, included is an endearing acoustic version of her previous single “Love Can Take Us There” along with a remix of the original. Worthy of note is also a cover of Tears for Fears’ “Everybody Wants to Rule the World,” which ambitiously attempts (successfully) to reinvent the song into something subtly different rather than produce a carbon copy. Like a lot of the EP, it’s dance music that has been peeled back and stripped to a refined core. 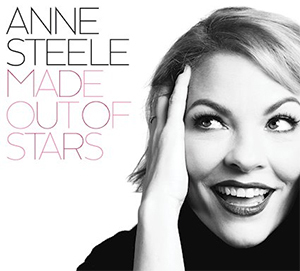 Made Out Of Stars occasionally feels like a collection of odds and ends but it’s impossible to complain because the quality of songwriting and execution is just so pitch perfect.